Customer Portal can be configured for a variety of scenarios. This reference explains each setting and when it would be applicable. 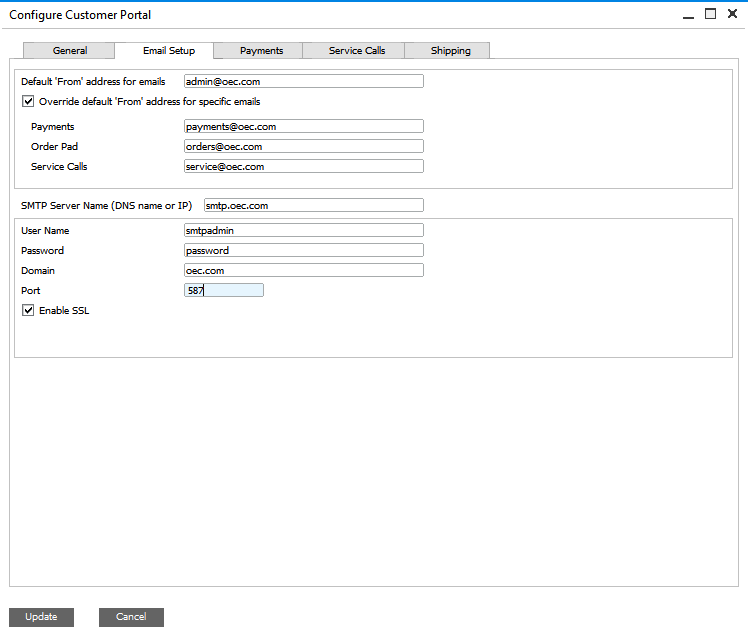 Customer Portal general configuration settings are accessible in SAP Business One using InterConnect Manager Add-On. Start the add-on and navigate to: InterConnect Manager > Administration > Customer Portal Config. The general tab is used to configure general settings related to Customer Portal. Expand the sections below for details. Edit basic configuration details on the Customer Portal Config General tab. As needed, allow users to reset their own password. When checked, Enable users to reset password will prompt users to answer their security question, then email their registered address with a reset password link. For installations with advanced reporting, configure Report View editing settings and roles. Enable report view editing (6); configure an admin-level access role (7). Typical Customer users should not have access to this feature. If checked, Enable Report View Editing (marker 6) allows users with the assigned role (marker 7) to edit report view layouts on behalf of other users. This is appropriate for test administrator accounts, or for customers who have special access permissions, such as priority customers with customized reporting. Configure this setting on all installations. This will allow admin settings to automatically refresh on the web. Enter the Customer Portal web address (8) to update admin settings immediately. 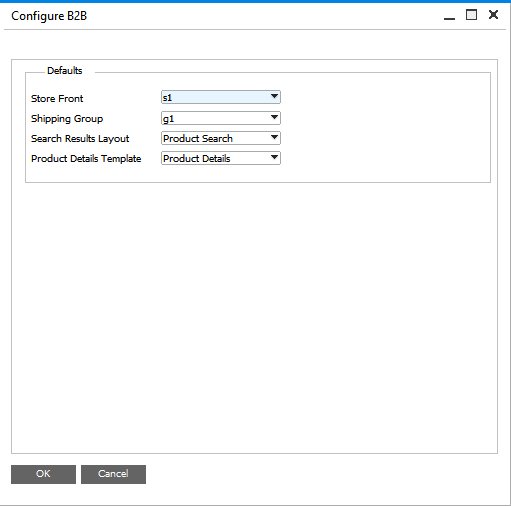 Enter the Search Engine Service Address (9) to enable B2B configuration. Customer Portal Web Address points to the website URL, while Search Engine Service Address points to the B2B Marketplace search engine, if applicable. For installations of Customer Portal that does not implement B2B Marketplace, Search Engine Service Address must be left blank. If configured, once you press the OK button, the website will be refreshed automatically. If this setting is not configured, or if the website is inaccessible, configuration settings may be manually refreshed manually on the website using the URL /resetconfig.ashx. 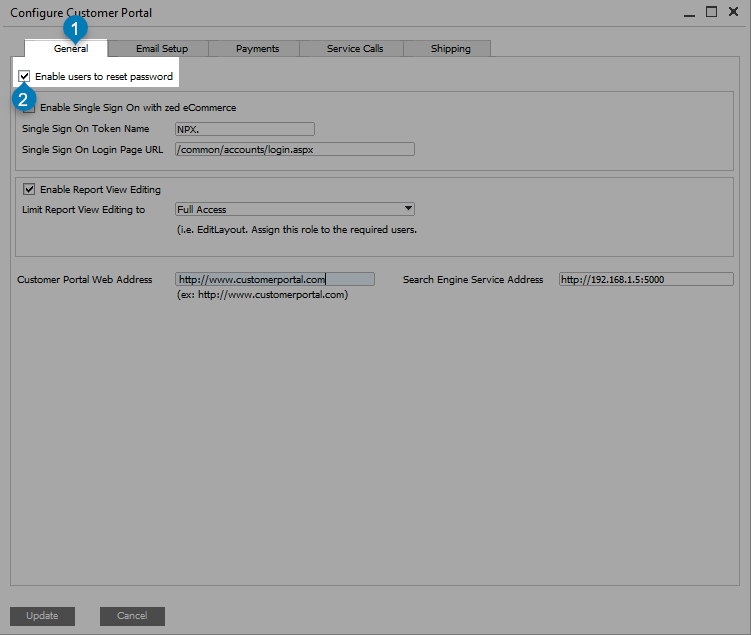 This will re-load config settings and redirect you to Customer Portal home page. 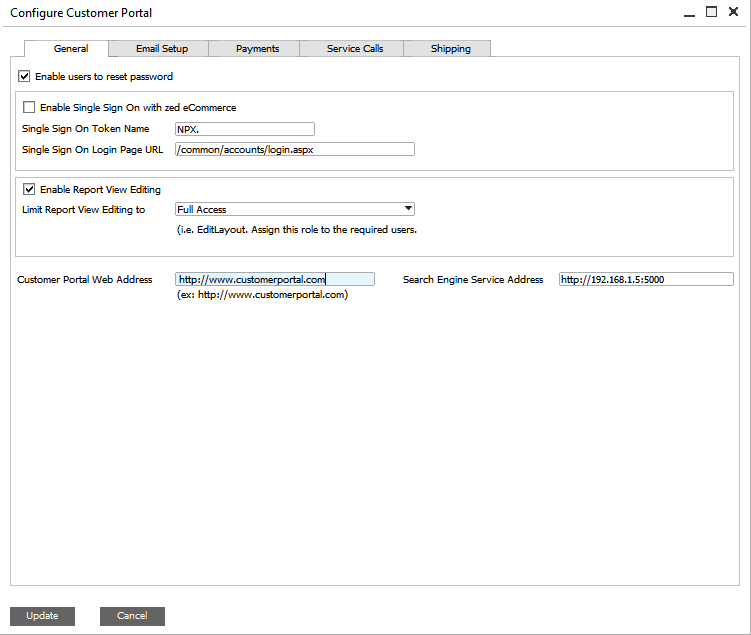 Use the Email Setup tab to configure SMTP connection details and settings related to notification emails. Expand the sections below for more details. 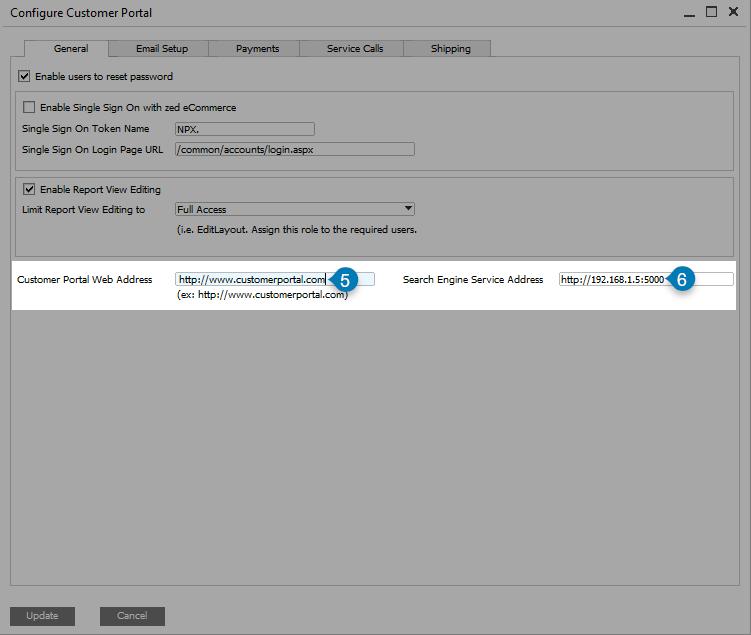 Edit email and SMTP configuration details on the Customer Portal Config Email Setup tab. Configure this setting if email notifications are used. Set the Default from address (1). The Default ‘From’ address for emails (marker 1) is used for outgoing emails when no override addresses are specified. Configure these settings only if unique ‘From’ addresses are needed for specific feature notifications. 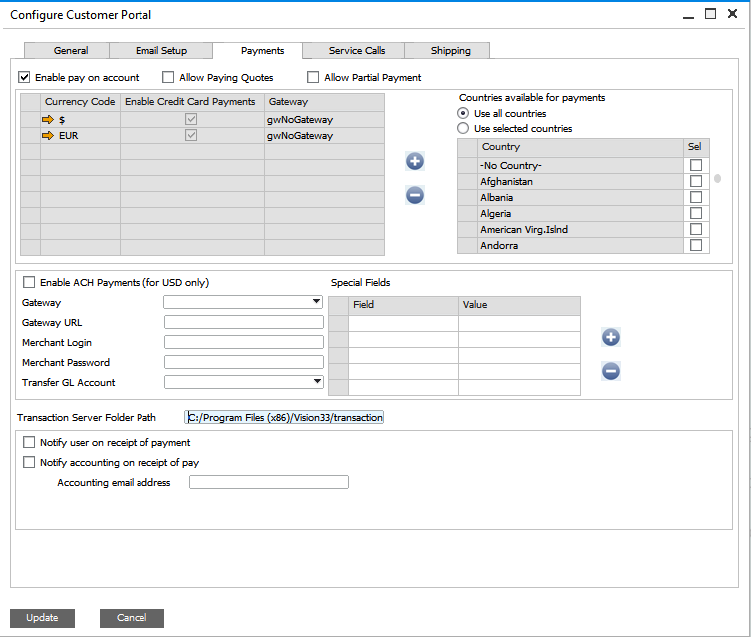 Override default 'from' address for specific emails (2), if desired; Configure Payment default from address (3), order default from address (4), service call default from address (5). If checked, Override default ‘from’ address for specific emails (marker 2) will use the specified email addresses for those features. If unchecked, the default from address will be used for all features. Configure this section if email notifications are used. Contact your email provider to determine which settings are needed to connect to your SMTP server. Use the Payments tab to define payment options per currency, as well as general options related to payments on Customer Portal. Expand the sections below for more details. 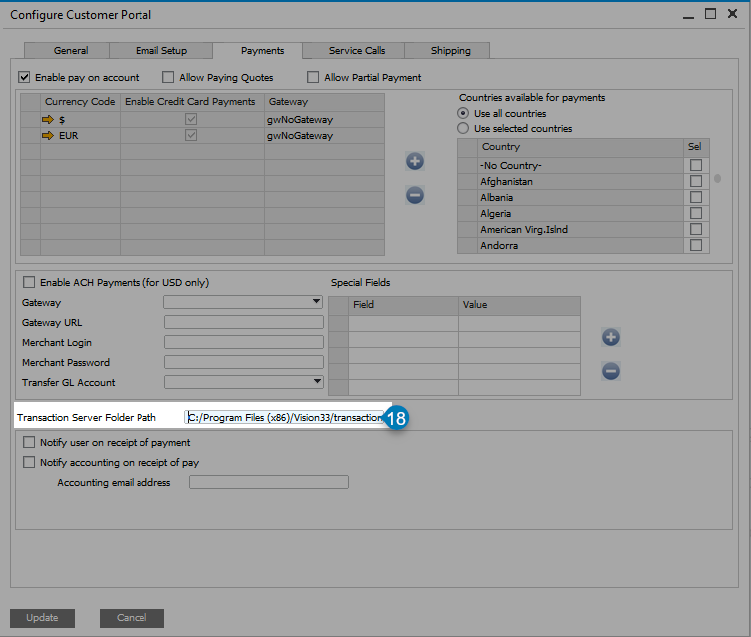 Edit payment gateway settings on the Customer Portal Config Payments tab. Review these settings for any system that accepts payments. 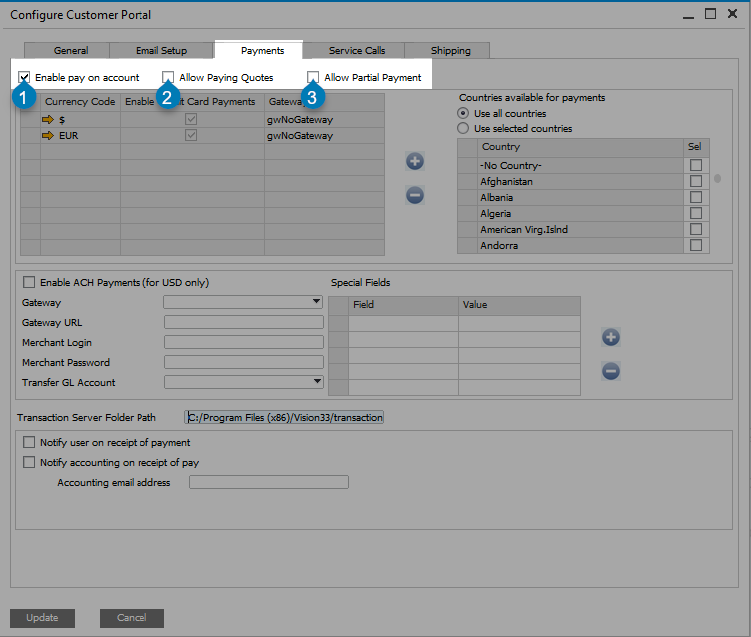 Enable pay on account (1); Allow paying quotes (2); Allow Partial Payments (3). When checked, Enable pay on account allows customers to create payments against their account without selecting an invoice first. When unchecked, customers must select one or more invoice and pay directly against the selected invoices. When checked, Allow Paying Quotes permits customers to select quotes to pay against. When checked, Allow Partial Payment permits customers to pay a partial amount against a selected invoice. If unchecked, the whole invoice amounts must be paid for selected invoices. If payments will be accepted on the web, perform the configuration below to set up payment options on a per-currency basis. 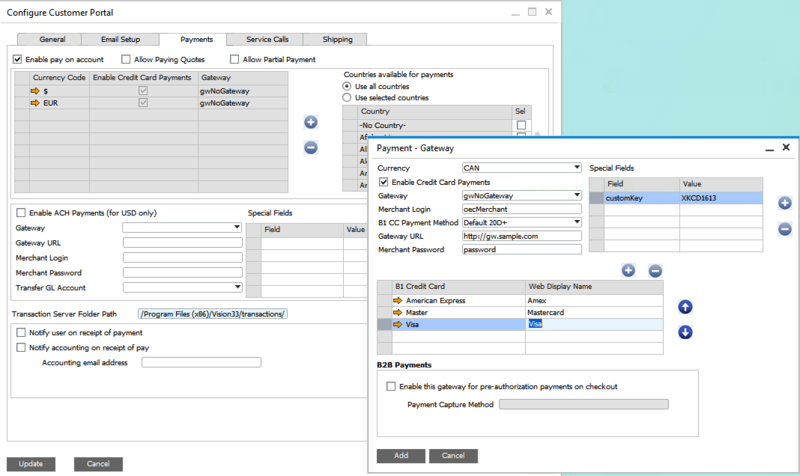 Note that for B2B installations, payments made at time of checkout will be captured, but must be settled manually within the time frame specified by the gateway vendor. 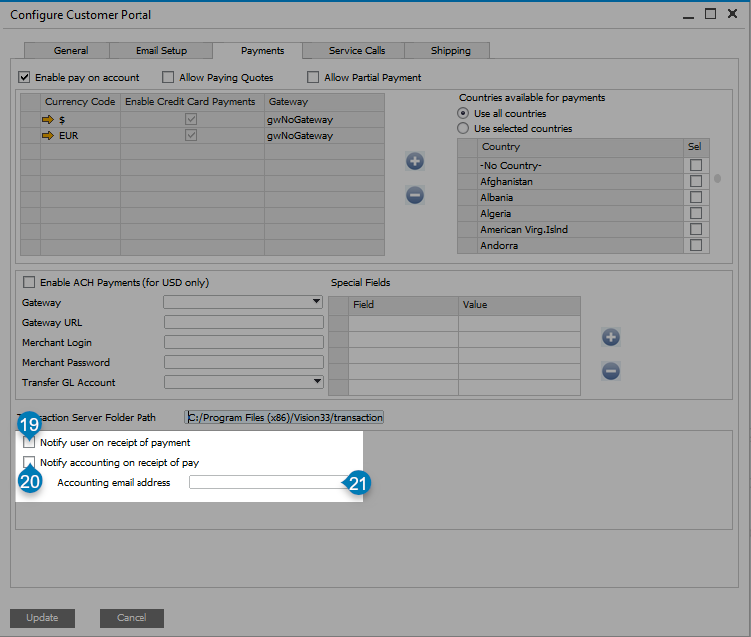 ACH is not available for B2B checkout payments, but may be used to apply payments to invoices on the “Pay Balance” page. 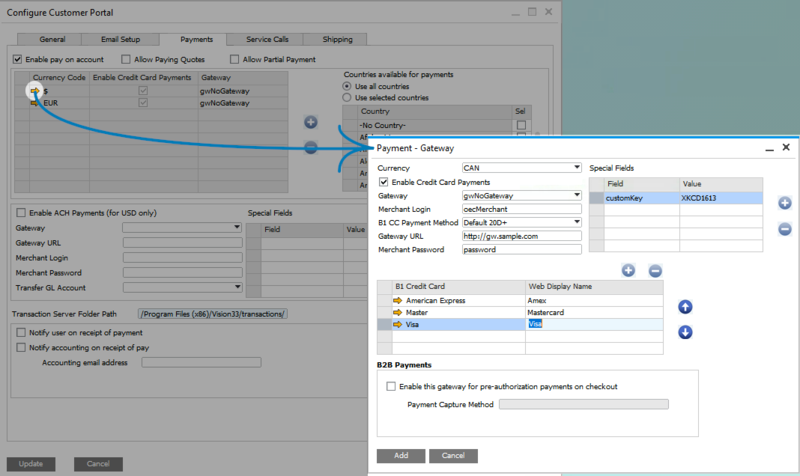 Configure a payment gateway (4) or add a new gateway (5); delete the selected gateway configuration (6); Select supported countries (7). Add a new gateway configuration using the plus button (marker 5 in the previous screenshot). This will open the New Gateway screen shown here. Edit an existing gateway configuration using the golden arrow drill-down (marker 4 in the previous screenshot). This will open the Edit Gateway screen shown here. Open the gateway configuration screen in either Edit or Add mode (marker 4 or 5 above). This will open the Payment Gateway details screen shown below. 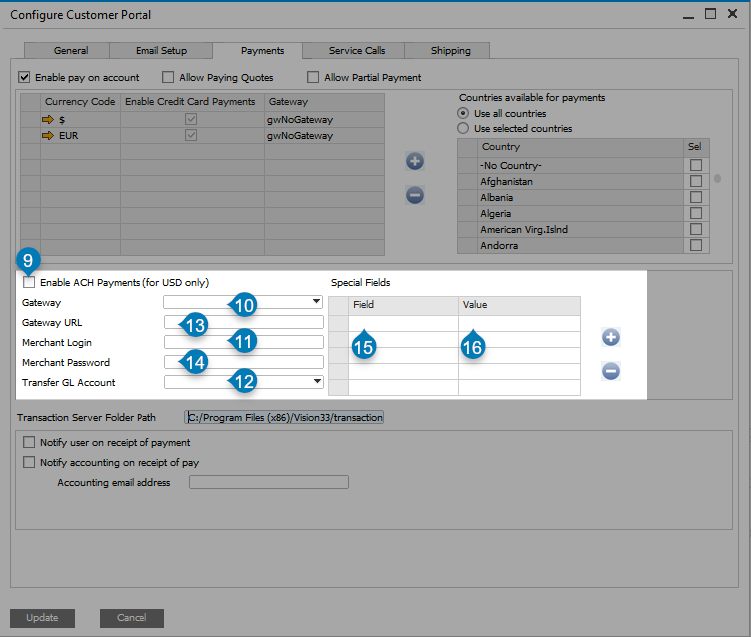 Select the currency for this gateway (8); Enable this currency's gateway (9); Select the gateway provider (10) and configure that provider's credentials (11, 12, 13, 14); Special fields required by a gateway provider may be added (15, 16); Add supported credit card options (17). First, select the currency (marker 8). If a gateway can be used by multiple currencies, settings must be configured seperately for each supported currency. When the gateway is ready to be used on the web, enable the gateway (marker 9). Configure the gateway details (markers 10 through 14) as defined by your gateway vendor. If required by the vendor, additional custom fields may be added using the Special Fields section (markers 15 and 16). Note that the instructions above apply whether you’re configuring Credit Card gateway details as shown in the screenshot above, or ACH gateway details as shown in the screenshot below. ACH payments are only available in USD currency. For USD only, ACH may be configured: Enable ACH (9); Select the gateway provider (10) and configure that provider's credentials (11, 12, 13, 14); Special fields required by a gateway provider may be added (15, 16). 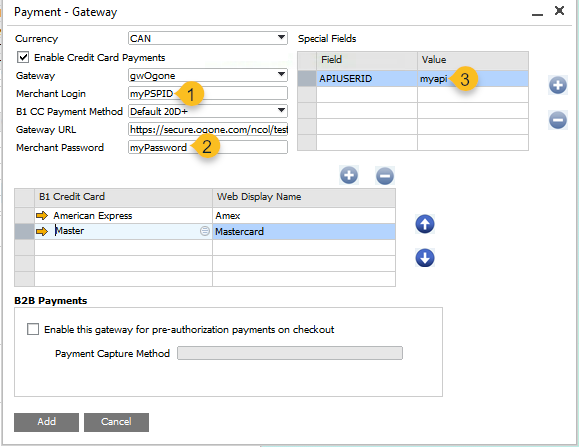 Apply these advanced settings when configuring Ogone payment gateway. For Merchant Login, use the PSPID (1); For Merchant Password, use your password (2); Add a special field, named APIUSERID, and set the value as per your account (3). For Merchant ID, use your Ogone PSPID. See marker 1 in the screenshot above. Ensure your Merchant Password is set to your Ogone password. See marker 2 in the screenshot above. Make sure to add a Special Field. Set the Field to APIUSERID and set the Value to your unique API User ID. See marker 3 in the screenshot above. 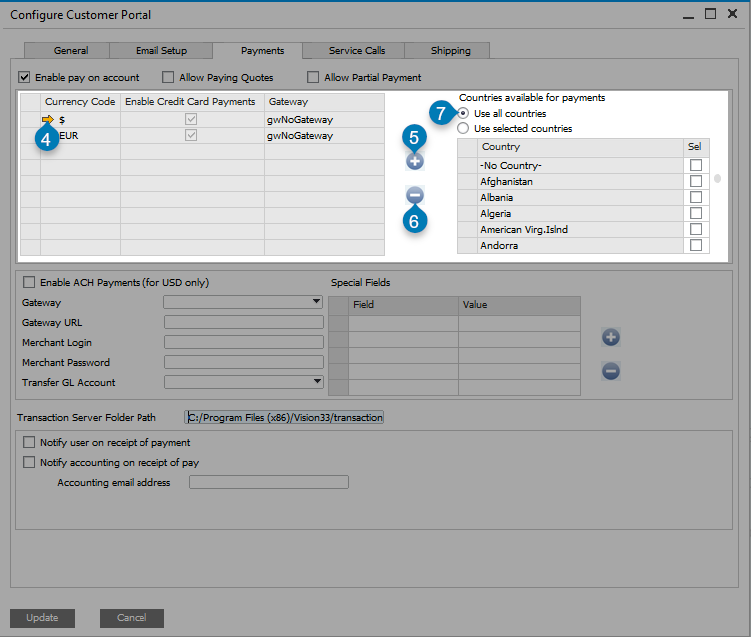 Configure this setting for any system that accepts payments. Specify a folder on the web server (18). This folder is used to save payment transaction records on the web server. Files saved here contain basic details such as a transaction ID from the payment provider and the payment amount, but does not include secure details such as credit card number. Ensure this folder is configured for any system where payments are accepted. Also, ensure this folder permits write-access by the IIS user assigned to Customer Portal (typically NETWORK SERVICE). Configure these settings if email notifications should be sent when web payments are made by a customer. Send an email to the customer after web payment (19); Send an email to accounting after web payment (20 and 21). If the customer user should receive an email notification after they have made a payment on the web, the option Notify user on receipt of payment (marker 19) should be checked. 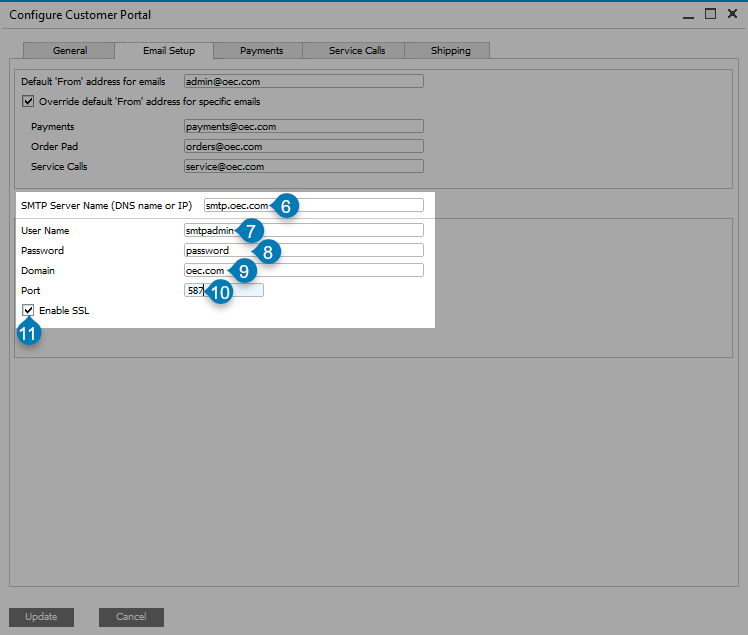 This will not send an email if a payment has been created in SAP Business One, only if the payment has been originated by the user on Customer Portal. If checked, Notify account of receipt of pay (marker 20) will send a notification email to the specified accounting email address (marker 21). Configure this section only if Service Call functionality will be used. Edit settings related to Service Calls. Enable attachments (1) and configure upload settings (2 and 3); Enable custom service call processing (4); Enable email noficiations (5, 6, 7). 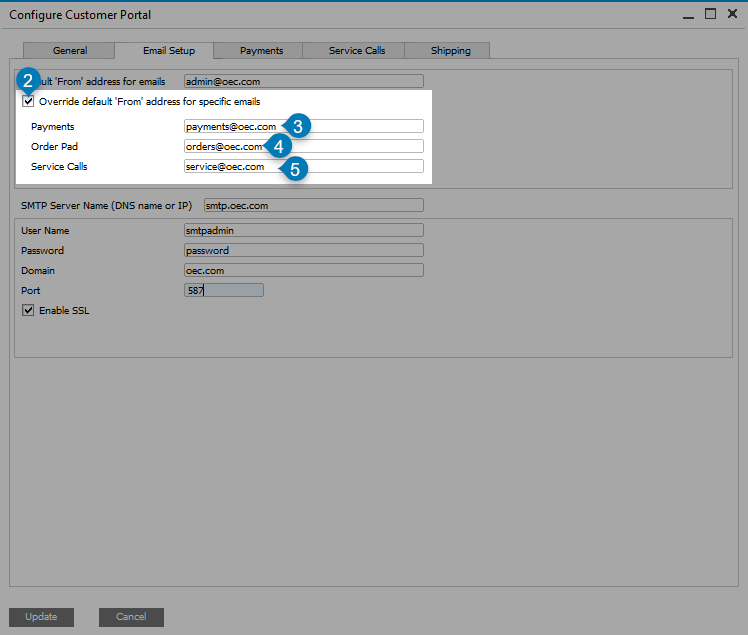 If the Service Call module is used in SAP Business One, this may be enabled on the web as well. If checked, Enable Attachments (marker 1) allows users to upload certain file types (specified on the web front-end), and they will be uploaded to the URL and folder specified (markers 2 and 3). Note that attachments are web-only and will not be loaded directly into SAP Business One. If service calls must be custom processed using XSLT, check Enable service call xslt processing. This will apply the XSLT before loading the Service Call into SAP Business One. If you have an email address for your service team, you may enable email notifications (marker 6) and provide a service desk email address (marker 7). This will generate an email whenever the customer creates a new service call on the web. Configure these settings if tracking numbers are used for deliveries in SAP Business One. 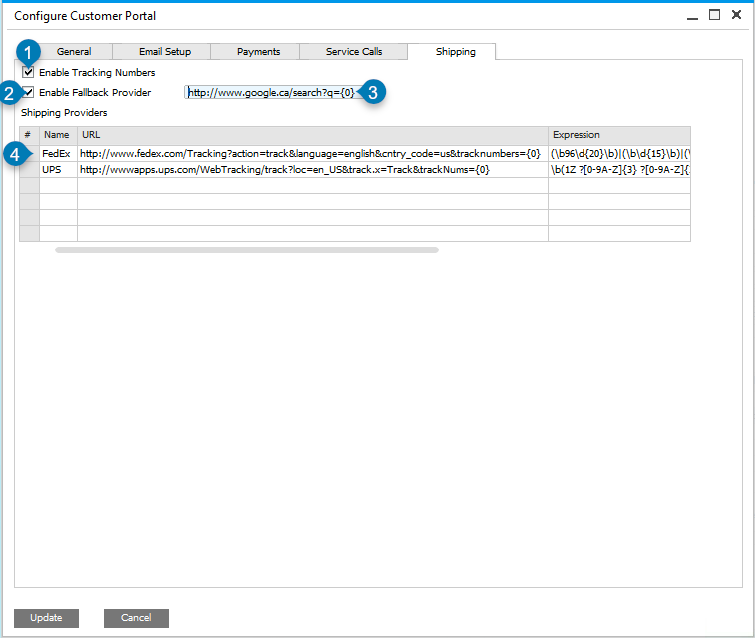 Use this tab to enable shipment tracking links on Customer Portal. Enable tracking number links (1); Enable a fall-back lookup (2 and 3) if the configured providers (4) don't match the tracking number. If checked, Enable Tracking Numbers (marker 1) creates a link on Delivery tracking numbers. The link uses a Regular Expression (RegEx) configured based on provider (marker 4), and if the RegEx pattern doesn’t match what’s been entered in the tracking number field, the fallback provider will be linked (marker 3) instead. The Welcome Tab was moved to Store Fronts as of version 92.3. Visit the Documentation Archive for this and other version-specific settings. 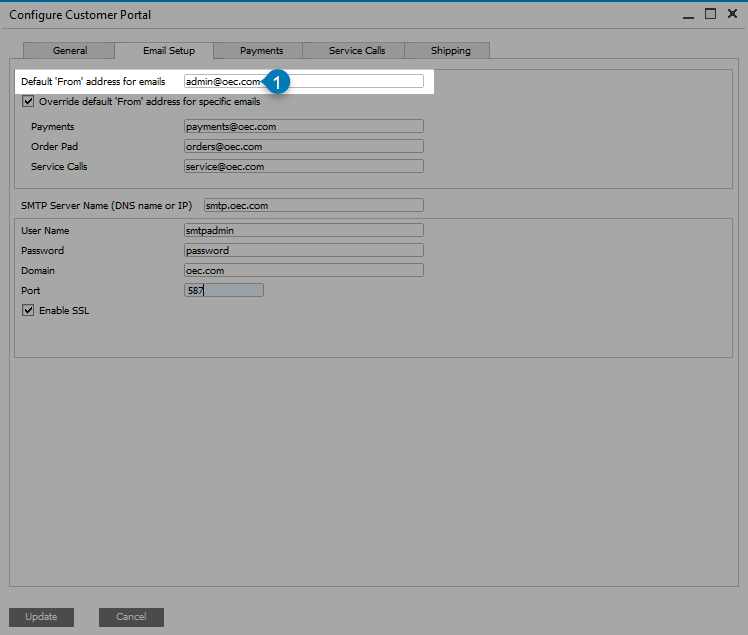 Order Pad configuration settings for Customer Portal are accessible in SAP Business One using InterConnect Manager Add-On. Start the add-on and navigate to: InterConnect Manager > Administration > Customer Portal Order Pad. 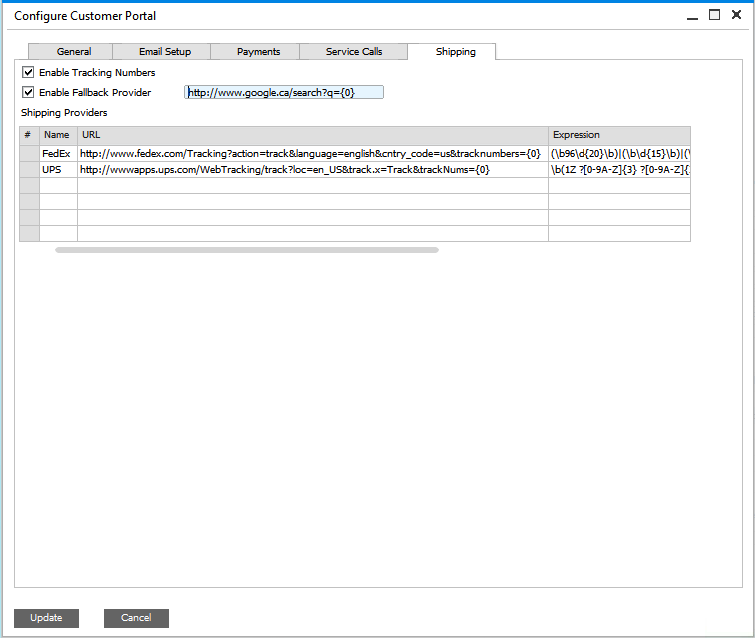 Use the General tab to configure settings related to Customer Portal orders and quotes, and order/quote notifications. 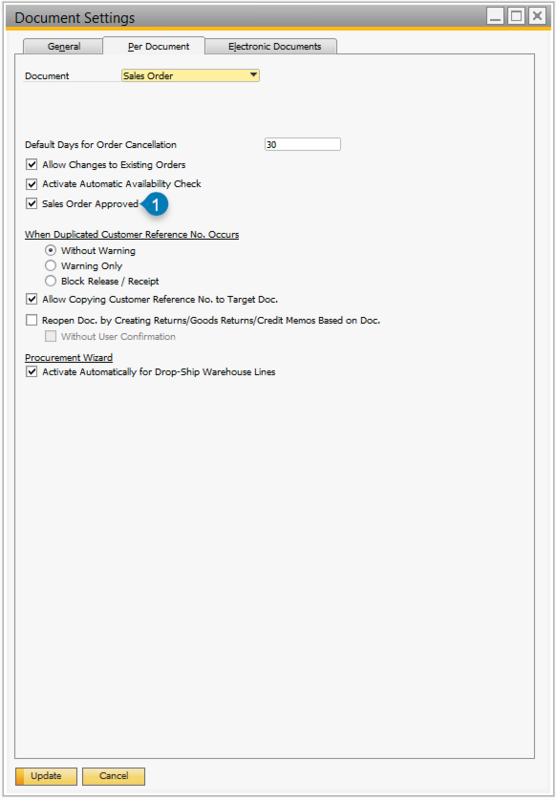 Edit settings related to orders, order notifications and additional fields. Review these settings on any system that uses Order Pad. 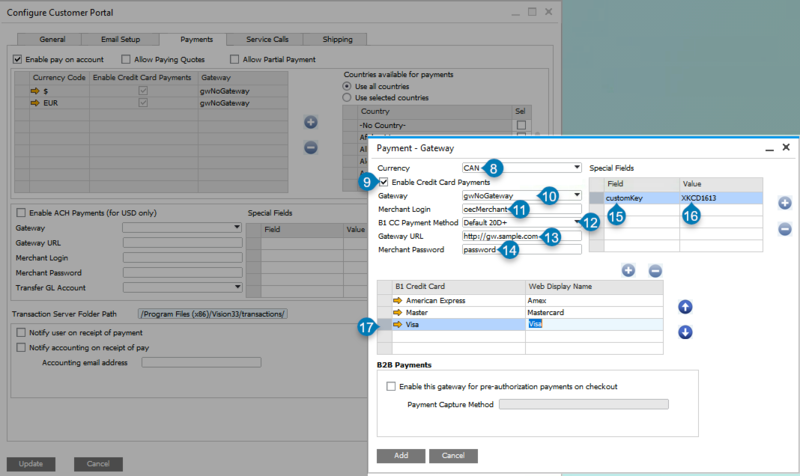 Select the Order Type (1); Configure Custom Address settings (2 and 3); Enable Orders (4) and/or Quotes (5); Enable editing Orders (6) and/or Quotes (7); Allow quick-add entry (8); Enable Simple Checkout Mode for non-B2B implementations (9). Order Type (marker 1 above) may be Unapproved Order or Sales Order. If Unapproved Order, the order must first be manually approved in the order’s logistics tab within SAP Business One, otherwise, the order will be a normal Sales Order document. Administration - System Initialization - Document Settings - Per Document tab - Sales Order document: When it is un-checked, the Sales Order Approved setting overrides Customer Portal Order Pad approval settings. Note: If this setting is changed, users must log out and log back in again to see this change. This may be enforced by recycling the Portal website’s application pool in IIS. If checked, Enable Custom Addresses (marker 2) allows the customer to create an address during checkout. The selected tax rate (marker 3) will be applied to all such addresses. If checked, Allow Creating Orders (marker 4) and Allow Creating Quotes (marker 5) allows customers to submit Orders and Quotes online. Both may be enabled at once, or just a single option may be enabled. 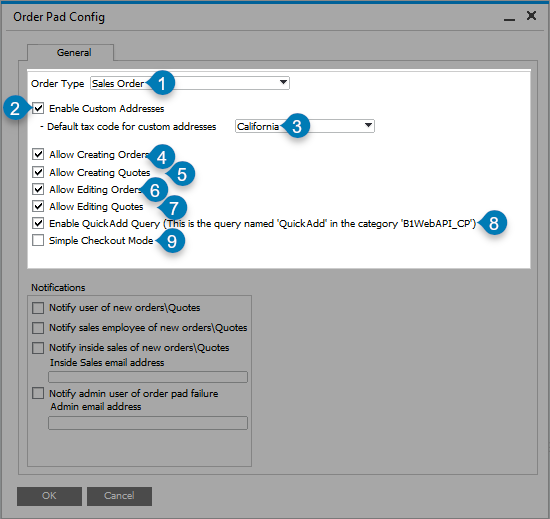 If checked, Enable QuickAdd Query (marker 8) allows a customer to view a multiple-item quick entry form based on the QuickAdd query. This query can be customized with an implementation customization. 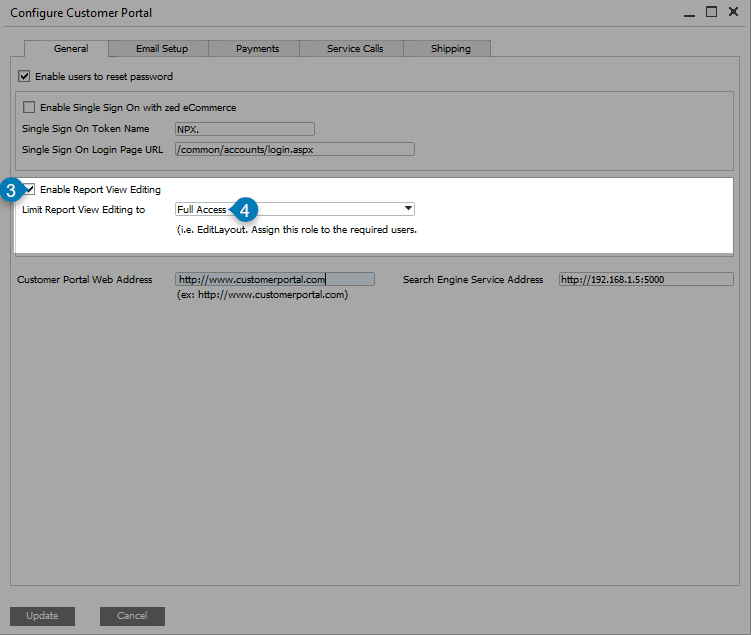 Configure this section only if email notifications are required after a customer has placed a web order. Send an email to the customer who placed the order (10); Send an email to the customer's sales person (11); Send an email to a specified address (12, 13); Notify an admin upon order errors (14, 15). If checked, Notify user of new orders\Quotes (marker 10) will send an email to the customer who placed the order. This can be used as an automated order confirmation, and is appropriate in systems where the Order Type is set to Sales Order. If checked, Notify sales employee of new orders\Quotes (marker 11) will send an email to the customer’s assigned sales employee, if an email address is associated with that employee master data record. 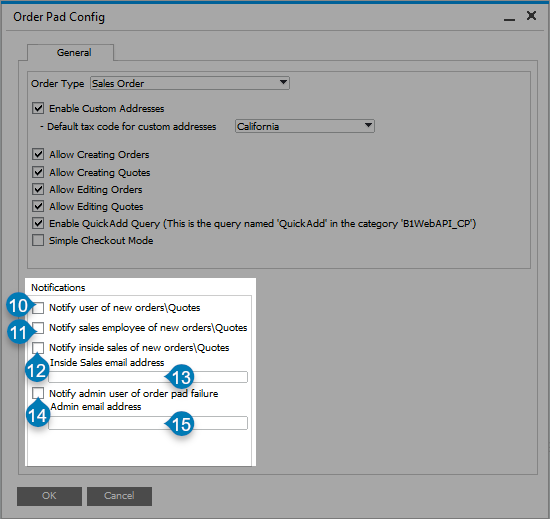 If checked, Notify inside sales of new orders\Quotes (marker 12) will send an email to the configured email address (marker 13) whenever any customer places a web order. 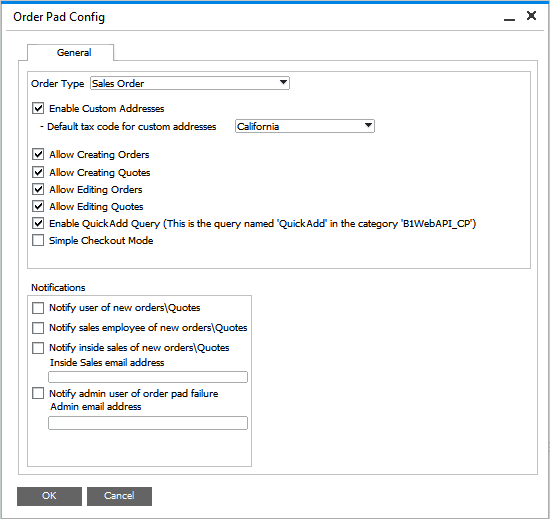 If checked, Notify admin user of order pad failure (marker 14) will send an email to the configured admin email address (marker 15) only when a customer encounters an error during web order creation. As of version 93.1, this tab has been moved to the advanced UDF configuration screen. See Configuring Additional Fields for more details. For versions 93.0 and lower, visit the Documentation Archive for this and other version-specific settings. B2B Global Config applies only to B2B Marketplace implementations. To configure Global B2B settings, in SAP Business One, start InterConnect Manager Add-On and go to: InterConnect Manager > Customer Portal B2B > Setup > Global Config. Configure default settings for B2B Marketplace. Apply global defaults for B2B Marketplace. These settings may be overridden at the customer level, store front level, or product level. Store Front sets the default store front layout that will be used by B2B Marketplace. 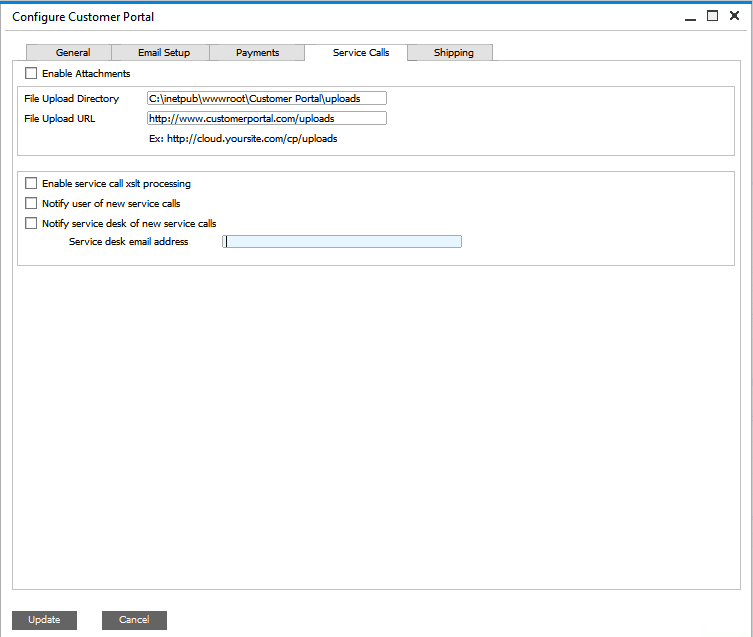 Customers may be assigned another Store Front using Business Partner configuration. Shipping Group sets the default shipping group assigned to customers who use B2B Marketplace. 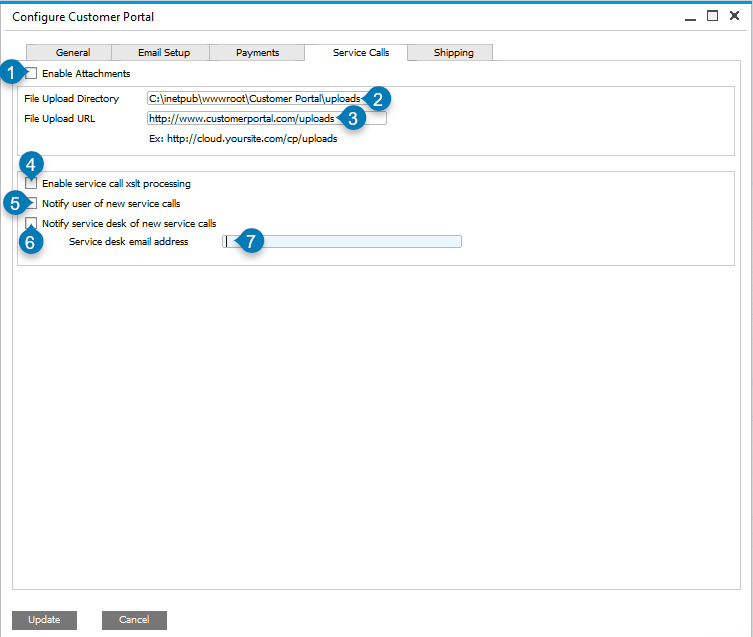 Customers may be assigned to another Shipping Group using Business Partner Configuration. Search Results Layout sets the default Search Collection assigned to a B2B Marektplace web store. This may be overridden in Store Front configuration settings. Product Details Template sets the default template used to display products within a B2B Marketplace web store. This may be overridden in Web Product configuration options.